Insurance in Switzerland was dominated by foreign companies until the end of the 19th century. One possible explanation for this, particularly noted at the time, was Switzerland's lack of overseas business activities and as a result, its insufficient commercial experience. But other important factors also hindered the spread of insurance in Switzerland; the Confederation's demographic, economic and political structure at that time and the readiness of the population to make charitable donations. The development of a Swiss insurance industry was, however, encouraged by the standardisation of coinage and the postal system, combined with industrialisation. Early forms of insurance had existed in Switzerland since the days of the ancien regime, in the shape of licensed begging and Poor Laws, for example, while the Church organised charitable collections when disasters struck, and regional aid funds had been set up in some places. Buildings insurance in Switzerland dates back to the beginning of the 19th century, when several cantonal buildings insurance institutions were founded one after the other. The first was the "Aargauische Gebäudeversicherung" in 1805, and between then and 1812 another 14 cantons – Glarus among them – founded their own. 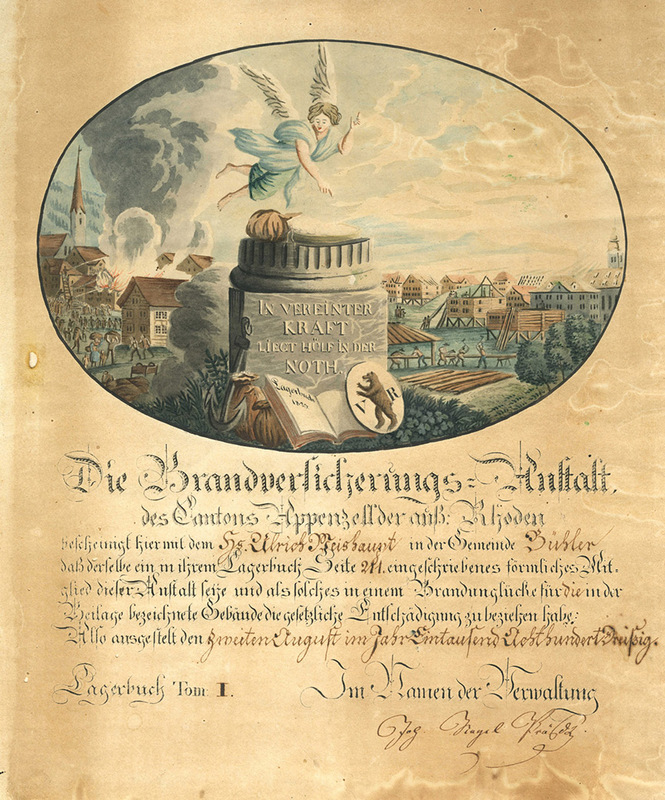 The country's first private insurance company was the "Schweizerische Gesellschaft zur gegenseitigen Versicherung des Mobiliars gegen Brandschäden (Swiss Company for Mutually Insuring Contents against Fire Damage)" ("Schweizerische Mobiliar"), which was founded in 1826.